A new wearable sensor based on silver nanowires has been developed by North Carolina State University researchers. The sensors are designed to monitor electrophysiological signals and could be used to monitor electrocardiographs (EKGs) and electromyographs (EMGs) — even when a patient is in motion. Electrophysiological signals can be used to track patient health in certain wearable technologies. They may also be useful in medical device research, or as interfaces between robotic prostheses and a user’s muscles. One of the most common applications for sensors like these is in hospitals for EKGs and EMGs. Unfortunately, existing sensor technologies, which are referred to as wet sensors, suffer from several drawbacks. Because they use a conducting gel, wet sensors can dry out, leading to an interruption of the signal and a loss of accuracy. These sensors also irritate the patient’s skin. To overcome these issues, North Carolina State University (NC State) researchers have turned to silver nanowires, according to a recent article from NC State News. The new devices are compatible with existing EKG- and EMG-reading instruments, but they have higher accuracy than existing wet sensors. This is true even if a patient is moving, because the sensors are able to maintain close contact with the patient’s skin. The nanowire device shows no signs of skin irritation, which is an important quality for long-term monitoring, according to a recent article published by the team in RSC Advances. 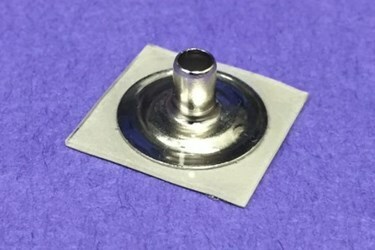 Silver was chosen as an electrode material because of its high conductivity and ability to transfer electricity efficiently. To fabricate a sensor, the silver nanowires are embedded in a silicone polymer and are situated so they can undergo significant stretching and deformation — all while remaining conductive. This latest sensor design was based on previous work performed by the team. Composites like this one have been able to withstand up to 50 percent elongation, while still maintaining their conductivity, according to another article from NC State News. Additionally, silver can be printed onto circuits, which is an approach the team has considered in the past. Developing wearable sensors is part of the medical device research space that is expected to skyrocket in coming years. Some observers predict that that the wearables medical device market could reach up to $5.8 billion globally by 2019.